*If holiday is a weekday, there’s no schedule change. 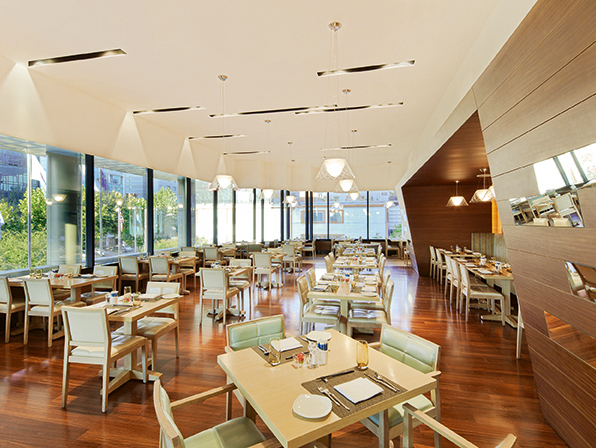 Our buffet restaurant The Square was designed by the world-renowned architectural design agency Wilson Associates. The spacious dining area exhibits a modern chic and is equipped with partitioned rooms for special occasions. Diners can watch their food being prepared right before their eyes at the open kitchen grill corner, pasta corner, and sushi corner. The Square offers a diverse range of Korean, Japanese, Chinese, and Western cuisines. Its comfortable and relaxed ambience is perfect for business meetings or family gatherings. The restaurant has three reservation slots a day (breakfast, lunch, and dinner).